Now that the holidays are behind us, you might be thinking about how to break up the long, winter months ahead with a little fun and adventure. For some, it’s all about the tropical getaway. For others, it’s a ski and snowboarding weekend FTW—or even just a snowy cabin escape with friends. If the latter is your move, packing well is crucial. Nothing can zap the fun out of an outdoor adventure like an ill-conceived outfit. 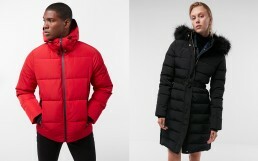 The good news is, as long as you’ve got a great performance coat—like our Heat Seal hooded puffer coat for guys or our long down coat for girls—you’re halfway there. Add these three essential elements to your suitcase and you’re well on your way to winter wardrobe nirvana. See you on the slopes! Every warm winter look starts with the right base layers. Long leggings and a Henley shirt look great, feel great, and most importantly, keep you warm in windy, frigid conditions. The soft, stretchy fabrics we use for our essentials will feel great against your skin all day, whether you’re skiing, making snow angels, or just enjoying a great view. Pro tip: Buy your true size. This is not the moment for a roomy, chill fit. You want your base layers to hug your body, not flap in the wind! In fashion and function, accessories matter. Swap your beanie out for a faux-fur trapper hat, your knitted gloves out for a pair lined in suede or leather, and your flimsy scarf out for an extra-thick, extra-long option and your coat will be infinitely warmer. Pro tip: Bring two sets of everything if you can. If one set gets damp from snow or sleet that day, you’ll have a backup for dinner that night that’s warm and dry. Nothing is more painful than ice-block feet. If your boots can accommodate two pairs of socks, layer up. Start with a moisture-wicking athletic sock for breathability and extra protection around your toes, then add thick, tall boot socks for cozy warmth all over. Pro tip: Keep hand and feet warmers in your bag as an extra precaution. If you can’t get to a fireplace, these disposable warmers are the next best thing.